It may We believe that something is about to happen. Angels exist, only sometimes they haven't got wings and we call them friends..
FOUND SUNDAY 8/8/99 at Miami Dade Animal Control! click on the picture above! 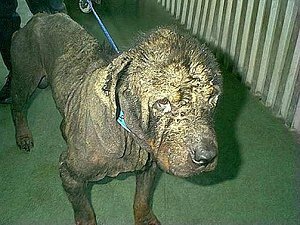 When we picked him up at the shelter and put him inside my car, every time he moved or shook, there were pieces of skin flying around us!!! YES, PIECES OF SKIN were flying inside the car. I remember telling Marlen as we were choking from the rotten odor, "DON'T OPEN THE WINDOWS!" She could not take the rotten odor and wanted fresh air. I asked her not to open the windows as the air flowing in would make things worse. In case someone missed the original post let me tell you about AMERICAN DREAM. He was picked up near Homestead, Florida by Animal Services after receiving a complaint call. 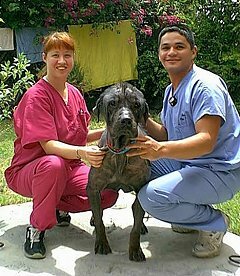 He is now at Tropical Park Animal Hospital in Miami, Florida. I am glad that I took him directly there from the shelter. HE NEEDED IMMEDIATE MEDICAL CARE AROUND THE CLOCK. The Miami Herald and NBC News came to the clinic to film Ellis. You should have seen the face on the camera man and the reporter!!!! They were shocked! They took several pictures and video of this dog. 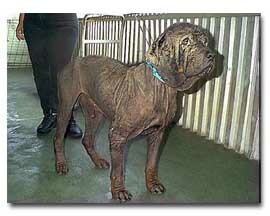 The pictures shown on this page do not really show the condition he is in. He is MUCH WORSE. On his first day at the clinic he did not eat anything, he was too weak. On his second day he was on TV!! (8/11/99) Miami local NBC News! Today, on his 3rd day he was photographed by The Miami Herald and they are running his story on the Sunday paper. I asked if people could access to the story on the Internet. As soon as I hear I will post it. Today, there was no more dead skin flying around, his little hairs were soft and you could see some color at the base of his hairs on his head! We have a call name for him now. It is Ellis. We named him after ELLIS ISLAND. It was at this island where immigrants came looking for the AMERICAN DREAM. Yesterday, he ATE a whole can of prescription food, slowly, very slowly. He IS eating now. He is in a very nice large crate being pampered. 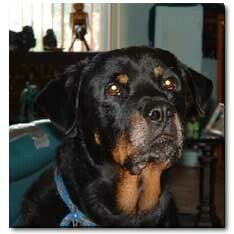 Maria, the vet tech (Rott owner, too) is constantly attending to him. He has a comforter to keep him warm. Today, Maria told me it is an exhausting job caring for Ellis as he has diarrhea very often. She walks him out of the clinic several times a day, but he is still going inside his crate. Marlen and I agreed on one thing, HE LOOKS MUCH BETTER. You can see COLOR in his feet!!!! I personally want to thank those who sent emails (zillions) received. The picture of this dog has hit the Internet and it is now being circulated among other breed lists, chat rooms, rescue groups. Several rescue groups have loaded up his pictures on their site! I know of several people who have created their own web page with his pictures! Emails have been received from other parts of the world also, Africa, Middle East, Hawaii... AMERICAN DREAM has become a RESCUE POSTER BOY! He will be forever remembered as he is embedded in the mind of those who have seen his pictures. MIAMI-DADE COUNTY is shaking. AMERICAN DREAM has been seen by local politicians, his story has been sent to government agencies. It is AMERICAN DREAM who will make a difference in saving abandoned pets, pet rescue and most important, ANIMAL SERVICES. The day will come when I will HUG this dog and kiss him in his cheeks! And I will tell him, I will make sure he knows, how much our entire country has been pulling for him! Ellis is by far the worst rescue we have ever seen. He needs A LOT of help and support. 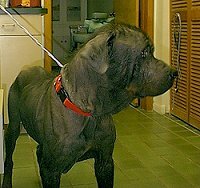 The story of American Dream aka Ellis and his pictures have been forwarded to other rescue groups, chat lists, other breeds lists. The amount of email I am receiving makes it impossible for me to respond to all, especially when so many are asking questions. 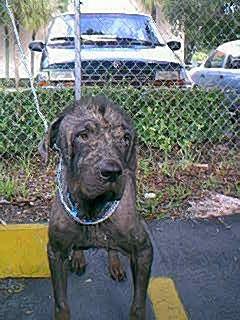 Animal Control in Miami received a complaint of a stray dog. Someone reported this dog to AC. 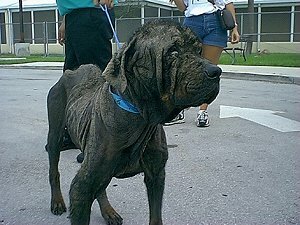 Ellis was picked up by Miami Dade Animal Services from the streets. No owner has been identified. 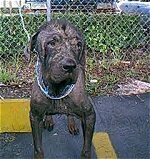 Apparently this dog had been roaming the area near Homestead, Florida. This area is agricultural and many of its residents are poor. Animal Control has been very cooperative with me concerning Rottweilers at the shelter. 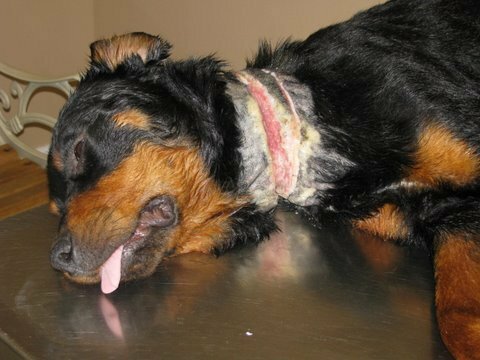 They allow me take every single Rottweiler, healthy or sick out of the shelter. We do not have enough foster homes to save them all. We do not have a problem with Animal Services. 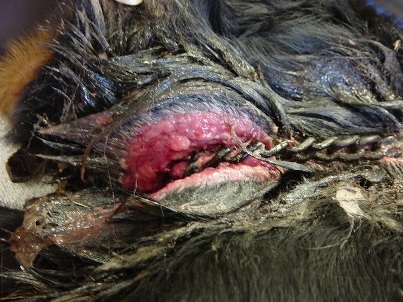 We have a big problem with irresponsible breeders and owners in this county. Personally, Ellis rescue will make me work more diligently in educating the children at my school Belen Jesuit Preparatory School where I am an Assistant Principal. Once a month, after school hours I will drive a school bus loaded with students to the Miami Dade County Shelter. I will show them the worst of the shelter, the room where the sick dogs are waiting to be killed. 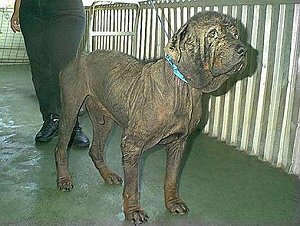 I will make sure they know it is not the workers at the shelter who are bad, but the breeders and owners of these poor animals who should be held accountable. Education is the key to success. 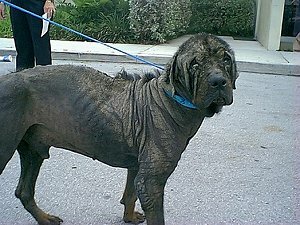 What has bothered me the most about this rescue, is the thought of this abandoned dog being in this condition for such a long time WITHOUT anyone doing something about it. I can't understand that. Again, Ellis was a stray. We do not know who the owner is or how long he has been roaming the streets or the agricultural fields. 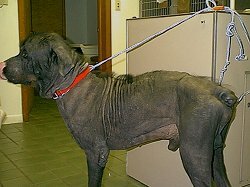 He spent 5 days at Animal Control. I found him there on his third day and took him out on his final day before being euthanized. I took him directly to my vet, Dr. Alberto Iglesias, at Tropical Park Animal Hospital (305) 553-4464. Dr. Iglesias is a GUARDIAN ANGEL. 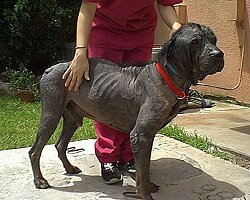 TODAY'S UPDATE: Marlen Valle and I visited him at the clinic. When he heard our voices he got up and wanted to come out of his crate. We took him out and he was so happy to be with us. He is eating a lot, no more diarrhea. His eyes have cleared up. 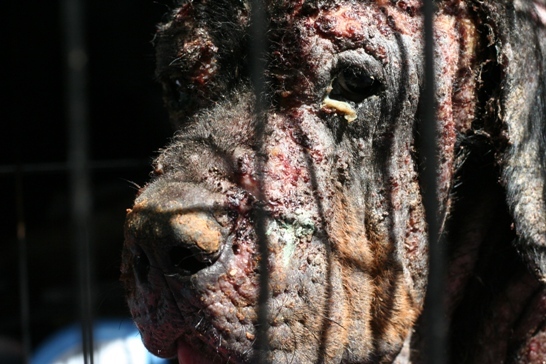 His skin is shedding old and sick cells. We continued to video tape his improvement and took several pictures. Here is a head shot of him as of today. Please, mark this site as I will be sending updates and pictures at least once a week. 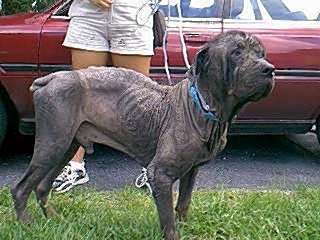 AUGUST 20, 1999 - TEN DAYS AFTER RESCUE! *Donations for his vet bill are still coming in. All those that came to my name, are being endorsed and DEPOSITED on the GULFSTREAM ROTTWEILER CLUB ACCOUNT. I have received all kinds of donations, medication, supplements, blankets. *There is a lady who visits him every other day, has brought him blankets, toys, treats. Her name is Anne, Guardian Angel Anne. She is from England. Anne loves Ellis and is begging me to let her adopt him. He is getting very attached to her. *Today Ellis had a very special visitor, another Guardian Angel. His name is Mike Holloway of Pet Massage. Mike works rehabilitating all kinds of animals, especially dogs. Mike gave Ellis ONE HOUR MASSAGE and he said he will be back tomorrow for more. I am 55 years old and I have NEVER had a massage, and this dog is getting the treatment of his life! *Two other Guardian Angels, Jaime and Maria the vet techs. Ellis is here with both. These two angels are constantly attending to Ellis. Jaime does all the veterinary needs and Maria the feeding, bathing, walking. The hands of Maria (What a beautiful name!) have done a miracle! Look at Ellis' skin! No more scabs! His skin feels very soft and there is no oozing anywhere. NO SMELL! Hair will slowly begin to grow. *The Head Guardian Angel is Dr. Alberto Iglesias. This man has taken this dog under his wings! He is worried about the heartworm treatment, but he says he has full confidence this dog is going to pull through. Ellis' heartworm treatment will be next month. AMERICAN DREAM, aka Ellis is a happy boy full of energy. He is hungry all the time. I think he wants to eat more and more, just in case that tomorrow ...there is nothing! Poor thing, he does not know that his suffering HAS STOPPED! Ellis will finally become AMERICAN DREAM! God bless all of you who take time to read his updates! To all of you who have sent a donation. A video will be available of this amazing DOG! AMAZING DOG! He is! Just 10 days after rescue, look at the difference! Twenty days after leaving the Miami Shelter he is now HOME! 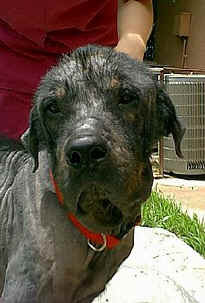 Ellis spent 20 days at Tropical Park Animal Hospital but he is now ready for TENDER LOVING CARE. Not that he didn't get some of it at the clinic, but here I will assure you that he is going to think HE DIED AND WENT TO HEAVEN! Ellis' temperament is of a dog from heaven, so maybe he did die and came back from there! Ellis is so sweet, so grateful. Before he left the clinic the Doctor wanted to take a blood sample. Ellis stood there with his arm stretched out and made no attempt to fight the needle. His eyes needed washing and he was squirted with an eye solution. Again he did not move. Ellis is convinced that whatever they do to him, it is to help him. 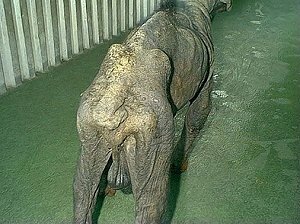 The pictures here attached were taken today 8/30/99 as we were getting ready to leave the clinic. Ellis is now weighing 77 pounds, he has gained 5 pounds. He will return to the clinic for his HW treatment when he reaches at least 85 pounds. He got into my car and I think he recognized my little Honda as the "ambulance" he rode from the shelter to the clinic on August 10th. Even after washing the interior I bet you he could still smell his own odor in my car! He sat down and enjoyed the ride! At home, he went straight into my backyard. He was probably thinking, "Wow! Where are they?" He was recognizing every dog odor. I prepared a good meal for him, a big one too. I added some Panacur to make sure those awful parasites never return to this poor guy. He ate his food in a RECORD TIME! It did not matter that I had told him that there was much more stored, just for him. He was then introduced to some of my other dogs. Ellis went into the garage where he will sleep in air condition. My dogs were shocked to see Ellis walk in! At first, they barked and all of the sudden there was total silence! They stared at him as they could not make out what he was. One of them probably said: "Oh Gosh! What happened to you Bro?" and another, "Gee, that is a SHORT hair cut!" Incredible, this dog comes to live with my dogs and they are all there quietly staring at Ellis, not a sound. Tomorrow, I will let my girls show him around and give him some pointers. After school, is bath time. And I promise more and better outdoor pictures. Tonight Ellis is HOME. I can sleep and don't need to think about this dog at last! Ellis IS from heaven above! Two more days and Ellis will celebrate his MONTH anniversary of his rescue! I wanted to wait until the 10th to make this update but so many people are asking about him that I couldn't resist the temptation. Ellis is a WONDERFUL DOG! He lives with my other dogs in air condition. He has not shown any type of aggression to any of them, including a neutered male I have. Ellis is hairless and tall, and he surely does not look like a Rottweiler! But, they all "accepted" Ellis as part of the gang. Some of you might think I was nuts for putting him with my dogs, but, Ellis IS healthy. His skin is completely cured, no mange, no oozing. I wanted him to "feel" he belonged here! I have no fear as God is with us. Ellis is eating three times a day with a ferocious appetite. He has gained weight and you can't see his ribs or his hip bones anymore. Every day I run my hands through his skin hoping to feel his hair growing out. I think hair IS growing. You can see his brown markings on his face and on all four paws. This is NOT a Rottweiler with black and mahogany markings, but GRAY AND MAHOGANY markings! HAHAHAHAHHA! I talked to Dr. Iglesias today. He wants to do his HW treatment in two weeks. Dr. Iglesias is feeling very positive that Ellis will go through his treatment without a problem. I will definitely make a post before his treatment as I am going to be looking for a lot of prayers for this AMAZING BOY. All donations received have been deposited to Gulfstream Rottweiler Club account. And more good news: AMERICAN DREAM, 'aka' Ellis will travel with me to the GRC Specialty Show on Friday, September 24, 1999 and he will be in the PARADE OF RESCUE! Ellis will receive a club medallion and a "We Are Not Disposable" bandanna. And here is a picture of Ellis and his Guardian Angel Anne. Anne is from England, but lives in Miami. This lady is hoping to adopt Ellis in the near future. Don't they look like a perfect match? God bless you for the time spent reading this update. After so many of you asking why I have not taken a picture with my AMERICAN DREAM, here it is. I want you to look at HIM! Look at the color on his face!!! HE LOOKS LIKE A ROTTWEILER! Those who had a doubt that he was a Rottie, what do you say now? Ellis is, our AMAZING DOG! And God continues to work miracles! You must read this poem that was written for Ellis! A hope for salvation I have pondered. No food to fill my aching stomach. Parasites and sores all across my back. Not bothering to look at my plea for sympathy. Anguish fills my eyes as I search for a home. Wondering why I am so very alone. When I finally feel all is without hope. From atop of my pit of despair someone throws me a rope. With caring hands they take me in. With love and compassion my recovery begins. But at my heart and soul they see so much more. The one who made me to love and be loved. That peoples hearts would be touched by my loving face. And with a little faith, that all can be forgiven. I long to show them how I really feel. With all my heart I give my thanks and affection. For they took the time to help change my direction. For because of those who rescued me I am the American Dream. Troy, I sit here and I have no words. I try to write but there is so much I want to say. I know words can't express the emotions in my heart. I thank you Guardian Angel Troy. I thank you in the name of OUR ...AMERICAN DREAM! Your poem says it all. Ellis, aka American Dream, is much more than just a rescue. I have always said that God has allowed us to rescue this AMAZING DOG for a good reason. Everyday, I see the LOVE for this dog in the hearts of so many. When I get up in the morning, or when I come home from work, first thing I do is to hug him tight. I want him to feel the love I have for him and for me to feel GOD'S LOVE FOR HIM! AMERICAN DREAM IS A MIRACLE. I thank God for allowing me to be a part of His plans. Troy, I have never met you, but you have become a part of me, of my life and history. What a wonderful gift! One more MIRACLE. And FLASH! Go look at his FIRST ANNIVERSARY! God bless everyone who has responded and is following up on OUR BOY.